Whether you admire Stephen Harper or not, John Ibbitson’s biography of our current prime minister is a fascinating read. Clearly, a lot of research went into the book, simply titled “Stephen Harper,” as it chronicles Canada’s recent political history while revealing the PM’s personality and leadership style. The book is divided into two main sections, “Rise” and “Power,” first narrating the making of the man and then examining his governing of the country as prime minister. Harper was born in the Toronto suburb of Leaside in 1959, the eldest of three sons. Ibbitson describes him as an academically gifted but introverted and bookish non-athlete, whose social awkwardness followed him into adulthood. After graduating high school, Harper went to the University of Toronto for a few weeks and then quit. He moved to Alberta to work as an office clerk for Imperial Oil, the same company his father was an accountant for. Harper felt at home in Alberta and, except for a few short stays in Ontario, lived there until he became prime minister in 2006. While living in both Edmonton and Calgary, Harper learned the “Western political ethos” that opened his eyes to the Canadian government’s manipulation of Alberta’s resources and historical ignoring of its needs. He eventually studied economics at the University of Calgary, and after graduating became involved in politics tangentially when he moved to Ottawa in 1985 to work as legislative assistant for Jim Hawkes, a Progressive Conservative candidate in Calgary West. Within a year he was back in Alberta where he met Preston Manning in May 1987. Harper joined the Reform Party and ran for MP for Calgary West. Although he lost he continued to work with the Reform Party as it formulated its mandate for Canada. He also met Alberta-born graphic artist Laureen Teskey in 1991; they married in Dec. 1993. Ibbitson describes him as an academically gifted but introverted and bookish non-athlete, whose social awkwardness followed him into adulthood. Ibbitson, a columnist for the Globe and Mail, describes Harper as a “good writer and powerful analyst” as well as a good speaker. The “clever tactician and far-sighted strategist” worked with Peter MacKay to unite the Progressive Conservative Party and the Reform Party of Canada to form the Conservative Party in 2003. Harper was elected PM in 2006 and set up a cabinet that included Jim Flaherty, John Baird, and Tony Clement. He proceeded to fulfil the items promised during his election campaign. In the second half of the book Ibbitson lays bare some of Harper’s less likeable qualities, such as his bad temper, paranoia, and micro-managing of party members. Laureen Harper is credited with keeping her husband on an even keel during his “funks” and getting him back on track when it seems he would turn his back on an issue rather than deal with it. 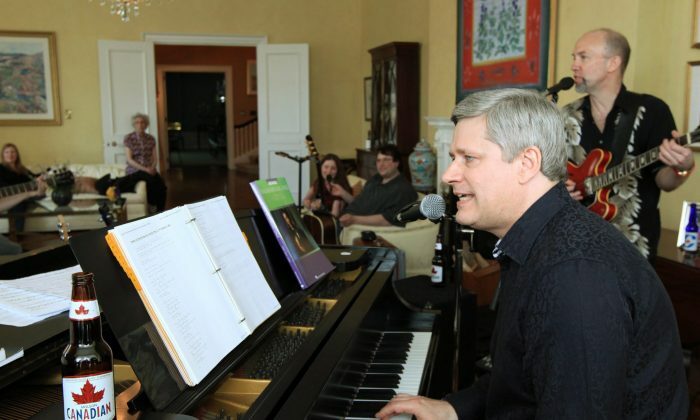 We also learn about Harper’s passion for music, his love of the Toronto Maple Leafs hockey team (he wrote a book about them called “A Great Game”) and the “Seinfeld” and “Coronation Street” TV shows, and his encyclopedic knowledge of Canadian border disputes. Ibbitson writes about six “Big Things” that Harper accomplished during his nine-plus years as prime minister, starting with lessening tensions between the federal and provincial governments. He did this by reducing the federal fiscal footprint, transferring funds to the provinces “without strings,” and removing equalization from programs that didn’t require it. Secondly, he successfully managed the economy during the global recession while reducing the GST twice and lowering corporate taxes. Harper believes that Canada’s foreign policy should be governed by values, and although he reoriented it, he also demonstrated hostility to Russian leader Vladimir Putin and has a weak relationship with U.S. President Barack Obama. He overhauled immigration and refugee policy with Jason Kenney, introduced his “tough on crime” policies, and successfully set up trade agreements with South Korea and Europe. During his tenure as PM, Harper has demonstrated both strengths and weaknesses. Two of his strengths: He apologized to aboriginal people for the government’s past maltreatment in a moving speech he wrote himself, and recently endured the senate scandal while in the midst of campaigning for re-election. Overall, Ibbitson writes that Harper is a good leader who follows his “core mandates” and has changed the politics of Canada. His final legacy in the history of Canadian politics remains to be seen.